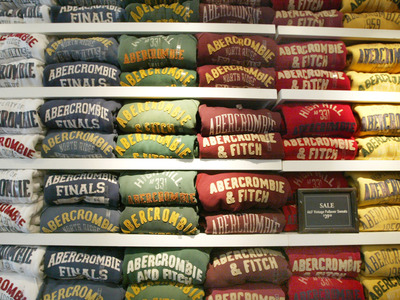 GettyAbercrombie & Fitch clothes on display in 2003. Abercrombie & Fitch shares plunged more than 12% Friday morning after the company announced a 12% decline in sales during the third quarter. The retailer made $US911.4 million in the quarter compared to $US1.033 billion over the same period last year. The company’s same-store sales fell 10% in fiscal 2013 and its namesake brand no longer ranks among teens’ top 10 favourite brands as of fall 2014, according to Piper Jaffray’s semi-annual survey on teen spending. 1. Ditching the logo business. The company said on an earnings call in August that its logo business would be reduced to “practically nothing” in North American markets by spring. 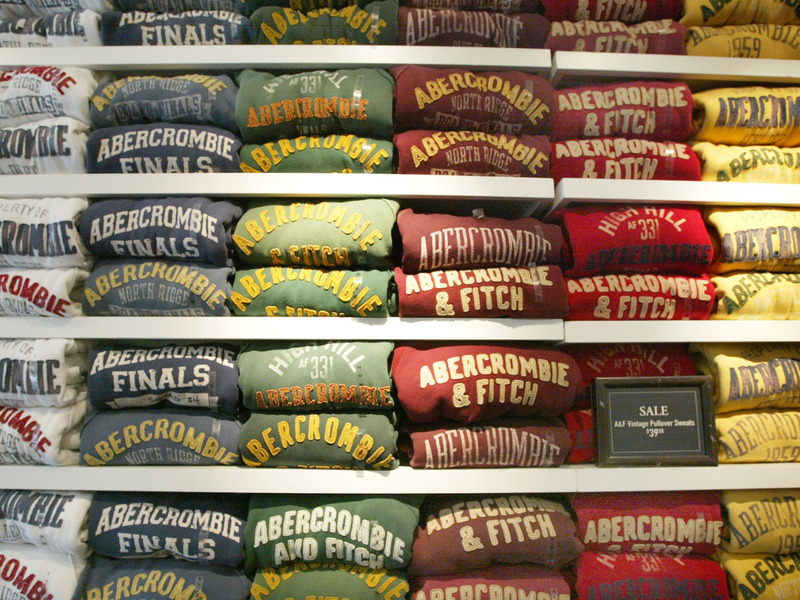 This is a seismic change in Abercrombie’s business strategy. Loud logos, as pictured below, have been central to the teen apparel maker’s fashions for decades. 2. The company is changing the nightclub aesthetic of its stores to make them more open, light, and inviting. Abercrombie is removing the dark shutters (shown below) from its windows to let in more light, turning down the volume of the music in its stores, and cutting back on regimented cologne spritzing inside its stores. 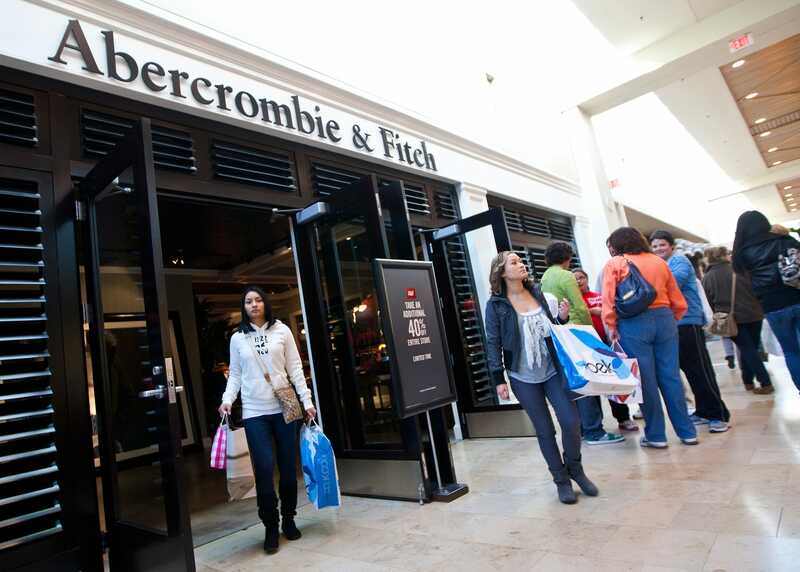 New Albany, Ohio, November 7, 2014: Abercrombie & Fitch (ANF) today provided a business update on the Company’s performance for the third quarter ended November 1, 2014. Net sales for the third quarter decreased 12% to $US911.4 million, compared to net sales of $US1.033 billion for the prior year third quarter ended November 2, 2013. Sales during the quarter were below expectations with comparable sales in September and October being significantly weaker than August. Although the international stores segment was the most difficult, the lower sales trend was broadly based. In addition, the Company now expects modest gross margin rate erosion for the quarter compared to last year, given the highly promotional and challenging environment. The effect of lower sales and gross margins will be partially offset by continued significant expense reductions. The Company’s results for the quarter were also adversely impacted by the strengthening of the U.S. dollar. Excluding anticipated charges related to the impairment of store-related assets, store closures, the Gilly Hicks restructuring, the Company’s profit improvement initiative, and certain corporate governance matters, the Company expects to report adjusted non-GAAP net income per diluted share for the third quarter in the range of $US0.40 to $US0.42. The comparable GAAP net income per diluted share measure is not available at this time, pending finalization of the above charges, but will be available when the Company reports its third quarter results on Wednesday, December 3. Non-GAAP financial measures should not be used as alternatives to net income and net income per diluted share and are also not intended to supersede or replace the Company’s GAAP financial measures. The Company believes it is useful to investors to provide the non-GAAP financial measures to assess the Company’s operating performance. “We are clearly disappointed with our results for the third quarter. Continued weak store traffic was the primary contributor to the weak sales trend, particularly in Europe, where the environment there showed signs of further slowing. In addition, the decline in sales of heavy logo product weighed on the sales trend as we continued to reduce that element of our assortment in response to changing consumer preferences. The Company will release its third quarter results prior to the U.S. market’s open on Wednesday, December 3, 2014 and hold a conference call at 8:00 AM Eastern Time. To listen to the conference call, dial (877) 874-1567 and ask for the Abercrombie & Fitch Quarterly Call or go to www.abercrombie.com. The international call-in number is (719) 325-4886. This call will be recorded and made available by dialling the replay number (888) 203-1112 or the international number (719) 457-0820 followed by the conference ID number 3359329 or through www.abercrombie.com.